Get Involved! 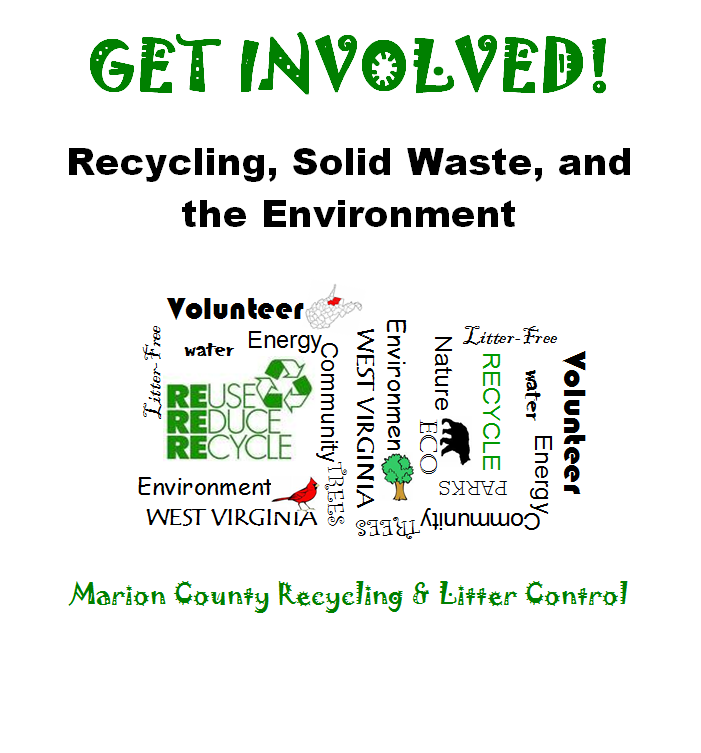 The Marion County SWA Recycling & Litter Control often gets questions about how kids and adults can get involved in their community by recycling, helping the environment, or being more green. There are many community groups to join – these are just some of them. If we missed your group, please let us know and we will add you to the list. The Great Backyard Bird Count is an annual four-day event sponsored by the Audubon Society that engages bird watchers of all ages in counting birds to create a real-time snapshot of where the birds are across the continent. Fourth of July – Have a sustainable picnic! Please call or email us for more details, if you see an activity that interests you. If you have an idea for a project or activity, please don’t hesitate to suggest it. Constructed from 97% recycled materials, including Wheeling newspaper, the Schrader Center is a regional showcase for “Green Architecture” and environmental awareness. The WV Envirothon is a conservation education program and competition for students in grades 9 through 12. Protect plant, animal and human health and the state’s food supply, foster economic growth by promoting West Virginia agriculture. Hold Poster contests, eat local challenge, etc. As one of West Virginia’s most unique living history museums, Pricketts Fort invites visitors to relive the pioneering spirit of Captain Jacob Prickett and his family. WVU Marion County Extension Serv.